Cermetek’s RSVP runs on our secure web server to support all AquaMon functions. RSVP collects the sensor data from the AquaMon nodes in the field and processes that data to provide the grower with continuous crop management information. The RSVP software operates three critical functions; the database; a data processor, and the web page. The database organizes and holds all of the data generated in the field. The data processor allows manipulation and interpretation of the data as required for the application as well as interpreting commands from the grower through the web page. 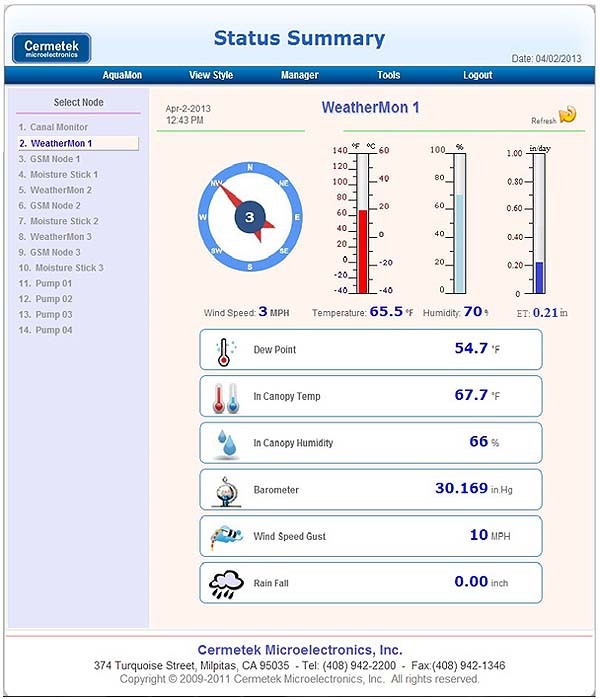 The web page allows the grower to access the accumulated sensor data and control equipment in the field to manage the farm. The server receives sensor data from the AquaMon node over the cellular data network. After receiving the data, RSVP organizes the data into a logical database. RSVP adds new data to the database each time the AquaMon node uploads new data. The grower can download the complete data base at any time to his laptop, tablet or smartphone. The database is downloaded in easy to use "CSV" format. Once RSVP loads the sensor data into the database on the server, the data can be manipulated to suit the grower's needs. The data processor performs a variety of functions including setting alarm levels, issue alerts based on those alarm levels, performing calculations, and executing user inputs from the web page. The web page is the grower interface to the system. All of the grower’s interactions with the AquaMon-RSVP system come through the RSVP web site. 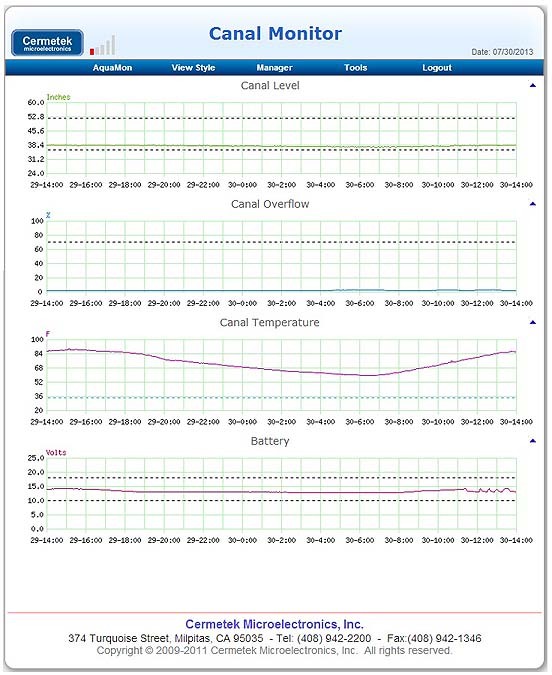 This includes viewing sensor data, altering sensor configurations, modifying alert and alarm settings, and controlling valves and pumps in the field. A true Cloud computing application, RSVP makes data accessible to the grower using any browser equipped smartphone, tablet or laptop. Hosted on a secure web server, RSVP insures that the grower has access to crop data 24 hours per day, 7 days per week so decisions are never delayed waiting for information. Grower definable passwords protect all crop data from unauthorized use. Growers have the option of selecting from multiple display formats including tables, charts and a graphic dashboard display. Programmable alarm values give the grower the flexibility to set alarm limits on sensor values and to define where and how alerts are issued when alarm conditions occur. The RSVP web page provides remote activation of equipment in the field including irrigation pumps and valves.